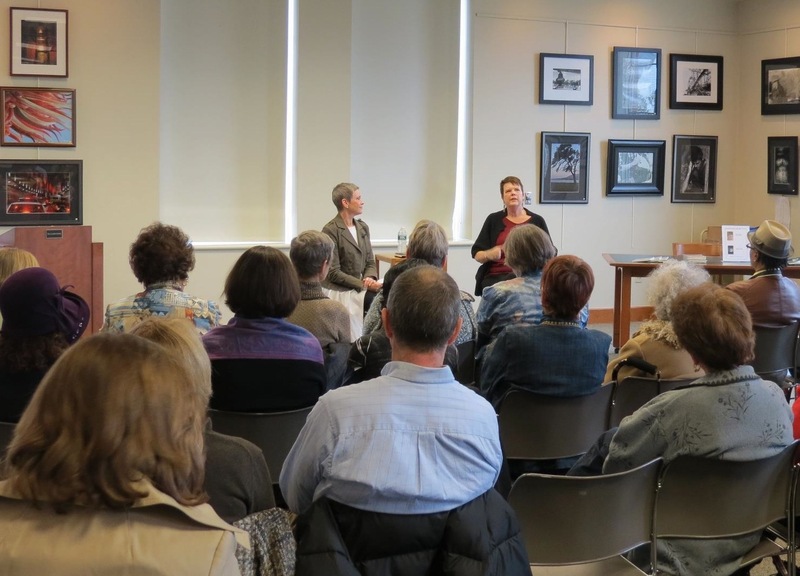 On Sunday, March 24, I attended a poetry conversation and reading at the Bernardsville Public Library. This twice yearly program, Tea and Conversation, is hosted by its creator, Julie Maloney. The program includes both prose writers and poets. This time Julie hosted New Jersey poet Anne Marie Macari. Julie began the event with an interview. She's a terrific interviewer who makes sure she's very familiar with her guest's work and has her questions mapped out but is flexible enough to alter them or add to them as seems appropriate. She first asked Anne Marie how she came to poetry. Anne Marie told us that one day her high school English teacher, who hadn't been doing poetry with her students, was absent. Another teacher, one who wrote her own poetry, covered the class and simply read Whitman aloud to the class. And that lit the fire. English teachers, please pay attention to that! No one came in and did a brilliant analysis of Whitman; someone came in and simply read him aloud. Julie asked Anne Marie what gave her the courage to delve into dark places in her poetry. Anne Marie paid tribute to her predecessors: Sylvia Plath, Ann Sexton, Lucille Clifton. She said, "We don't write in a vacuum. We're part of a legacy." Julie asked Anne Marie what she hoped people would take away from her work: Guts, the courage to face things, to do what you're afraid to do, to love. When asked about her future plans, Anne Marie said she doesn't make plans. "The artist moves into the unknown." And she has no fear of that unknown. We then moved to the reading part of the afternoon. Anne Marie read from Gloryland and She Heads into the Wilderness. She also read some poems from her forthcoming Red Deer, due out from Persea Books in 2015. The reading was followed by a Q&A with the audience asking the questions. Thanks to Julie for bringing so many programs to writers. She runs a group called Women Reading Aloud. That program includes workshops, poetry with yoga, writing retreats to Spring Lake in NJ, and even a week-long retreat on an island off Greece. Check out Julie's website for more information. This past Saturday was the 6th annual Girl Talk: A Celebration of Women's History Month. I began this event because I thought it would be fun. I've continued running it because it is fun. A lot of fun. People say, Oh, it must take so much time to put this together. I am not being modest when I say that it does not take much time to put it together. It's held at my local library, so I don't have to clean my house. I ask for volunteers to bake cookies and others to bring beverages. I always get more than enough. The library staff sets up the room for us and arranges for two volunteers to handle the book sale table. My job includes inviting the women poets, this year twenty-nine. If you want to run a similar event—and I encourage you to do so—that's a good number if each poet reads one poem. Invite a few more than you really think is just right because invariably a few drop out. We lost three this year due to illness. Invite poets who live pretty close to the event site. There will be fewer dropouts if the weather is uncooperative. One year we had a hurricane. This year we had snow. Also, poets who live nearby tend to bring more guests for the audience. I also do PR for the event. Not a big job as this can all be done online. 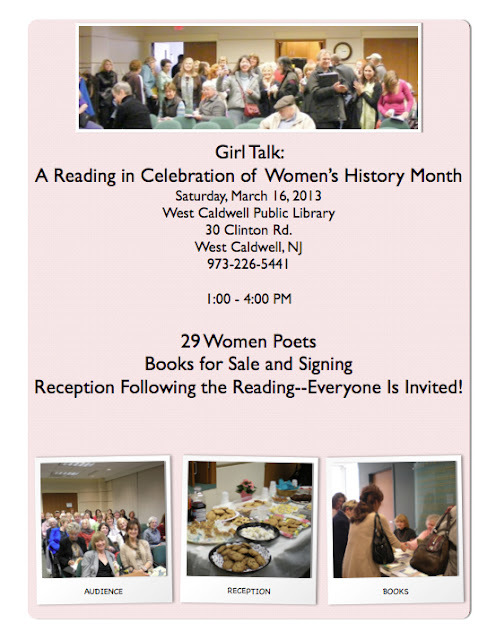 The librarian who works with me on this event sends a press release to local newspapers. I also ask the readers to each reach out and invite guests. Each year I include some new faces and voices. Some of these new readers are women who've asked to be included; some are women recommended to me. It would be lovely to have everyone back each year, but you need to rotate a bit to keep the event fresh and to keep the total to a reasonable number. I divide the reading into two parts, with a 15-minute break in the middle. That gives everyone a chance to browse the books and buy some. For the first few Girl Talks I invited all the readers with books to include one title for sale. However, starting last year I limited the book titles to more recent ones so the sale would be more manageable for the volunteers. This seemed to stimulate more rather than fewer sales. Fewer choices make for easier decisions? To stimulate book sales, each year I contribute copies of a craft book or anthology for a lottery. For each book a person buys, she puts her name in the basket. At the end of the day, there's a drawing. 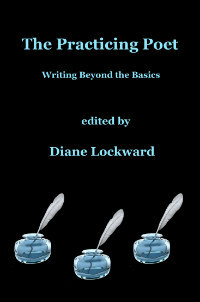 This year I gave away five copies of Wingbeats: Exercises & Practice in Poetry. I welcome the audience and introduce each poet. I do not give bios as I want the event to move along. However, bios are posted at the Girl Talk webpage. Following the reading, the bakers go into the kitchen and bring out the cookies for the Reception. Our approximately 80 guests are all invited to stay and enjoy the cookies and engage in some poetry conversation. More books are purchased and books are signed. Guess who goes home with the leftover cookies? Me. Here are some photos to give a sense of the day. Book Sale Table. Visitors browsing and buying! What a lovely sight to see. Crowd gathering before the reading. We filled the room. How lovely for poets to have a full room. Poet Deb Gerrish who so graciously brought a beautiful rose for each reader. And baked! And then brought beverages for one of the poets who couldn't make it. All in the midst of snow. Jean Meyers waiting to read. I met her years ago in a Dodge Poetry Workshop. Sandra Duguid signing her just released first book! 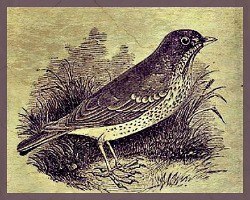 That is, if you're talking about Thrush Poetry Journal. This is a newish online journal, the child of poet Helen Vitoria. Departing from the more usual 1-4 issues per year, this journal appears every other month. Because of the increased frequency of the journal's appearance, each issue includes a limited number of poets. The current March issue includes 15 poets, each with one to six poems. And that's it. No essays, no reviews, no art. Just pure poetry. Naturally, I'm delighted to be one of those poets. 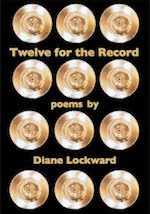 My poem Dreaming to Lionel Richie’s “Dancing on the Ceiling” is included. The muse for the poem was Philip F. Deaver's poem, Flying, which appeared on The Writer's Almanac back in 2005. Because I liked the poem, I saved it. You never know when you might need a poem. I subsequently used Deaver's poem as the stimulus for a prompt in my Poetry Newsletter. As I often do, I wrote my own poem first. After all, I choose poems that do something I'd like to do. I like it when poems talk to each other, when one poem sets another in motion. Deaver's poem and the prompt will be in my forthcoming book, The Crafty Poet. Thrush is attractively designed and Vitoria is working social media to the journal's advantage—and to the benefit of her poets and readers. She has a personal page and a journal page on Facebook and regularly posts notices and links to the journal and individual poems. This undoubtedly increases her readership and broadens exposure for the poets. The day this current issue went live her site received close to 3000 visits. Vitoria is undoubtedly also increasing the popularity of her online journal by giving a quick response to submissions. My acceptance came with a lovely personal note about the poem. I realize that not all editors can do this, but I appreciate it when it happens. I also have a poem, His Two Arms, at Zocalo Public Square. This poem, previously published in my book, What Feeds Us, was taken by Zocalo more than a year ago. I'd sort of forgotten about it, so finding it there came as a nice surprise. The poetry editor, Stephanie Brown, took four of my poems. This is the last of that group. Brown said she liked this poem because it's rare to find a love poem by a woman about a man. Is it?